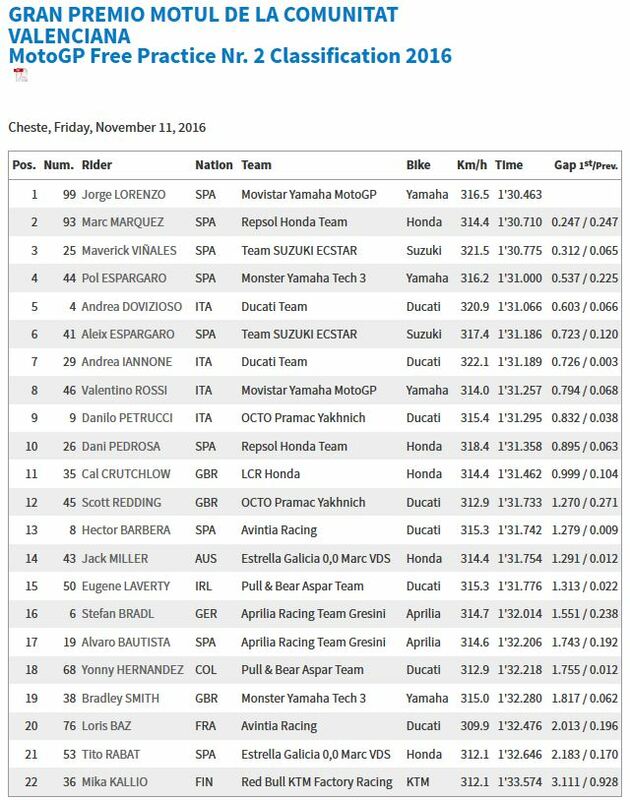 After Jorge Lorenzo (Movistar Yamaha MotoGP) ruled FP1 at the Circuit de la Comunitat Valenciana over four tenths clear, Marc Marquez (Repsol Honda Team) hit back in the afternoon to take the provisional top spot for much of the second session of the day. 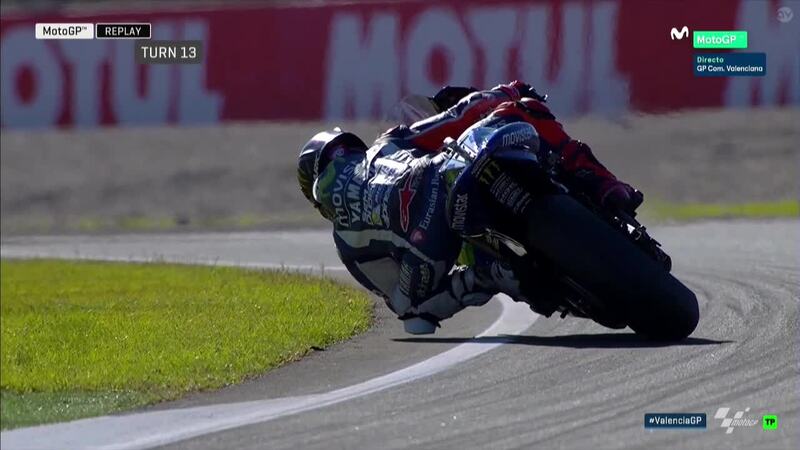 In the final few minutes of the day’s track action however, Lorenzo hit back to go quickest once again – six tenths quicker than his best of FP1 and two tenths quicker than his 93-numbered rival. The morning session was cooler, with the afternoon bringing the air and track temperatures up considerably – and the paddock hosted by uninterrupted blue skies. Maverick Viñales (Team Suzukia Ecstar) moved up the timesheets in the afternoon from P6 to end Friday P3 on combined times, with Pol Espargaro (Monster Yamaha Tech 3) moving up one place in the afternoon from a P5 in FP1 to fourth on Friday as the home crowd hit back to take control at the top of the timesheets. Andrea Dovizioso (Ducati Team) ended the Spanish dominion at the top in fifth by the end of play on Friday, despite the Circuit traditionally being more difficult for the Ducati. Aleix Espargaro (Team Suzuki Ecstar) was another improver as he moved from P7 in FP1 to P6 in the afternoon, just ahead of the second Ducati of Andrea Iannone in seventh. Movistar Yamaha MotoGP’s Valentino Rossi was second quickest on Friday morning despite a problem on an out lap, but was eighth by the end of FP2 and over seven tenths down on teammate Lorenzo’s best. Another Italian followed the ‘Doctor’ home, as Danilo Petrucci (Octo Pramac Yakhnich) ended day one in ninth, after teammate Scott Redding had also been in the top ten in the morning. Starting slow as he comes back from injury, Repsol Honda rider Dani Pedrosa was 22nd after his first few laps on track in FP1 – and then ended the session in P12. Gaining confidence and pace, the ‘Baby Samurai’ upped the ante further in FP2, and rounded out the top ten in an incredibly impressive Friday performance despite his ongoing recovery from a broken collarbone. The KTM RC16 ended its debut day down the timesheets, and was three seconds down in FP2 – but within a second of both Loris Baz (Avintia Racing) and Tito Rabat (Estrella Galicia 0,0 Marc VDS). Test rider Mika Kallio is at the helm for the one off appearance ahead of the Red Bull KTM Factory Racing team lining up full time in 2017, and cut half a second off his best from FP1.